Cutting your energy costs is a great way to save money especially if you’re facing high electricity bills from the recent cold weather. The problem for some homeowners is that they might not be certain about the kinds of energy problems to look out for in their home. With that in mind, we begin a 4-part series about what Energy Efficient Home Improvements you can complete in 2014. With this first installment, we’ll investigate your windows and discuss what to look for and some possible solutions to any issues you might have. We have a window in part of our basement where humid air tends to eddy and condense on cold surfaces. During the recent insanely cold weather in early January, ice formed on that window in a lovely forest-like pattern. It made me think of a grove of palm trees swaying in a tropical breeze. Unfortunately, it also indicated a bigger problem that had been damaging the window frame for years. The condensation problem causes the window frame to rot and let in cold air. The freezing aggravating the damage clearly indicated a serious draft and a process called “thermal bridging“. 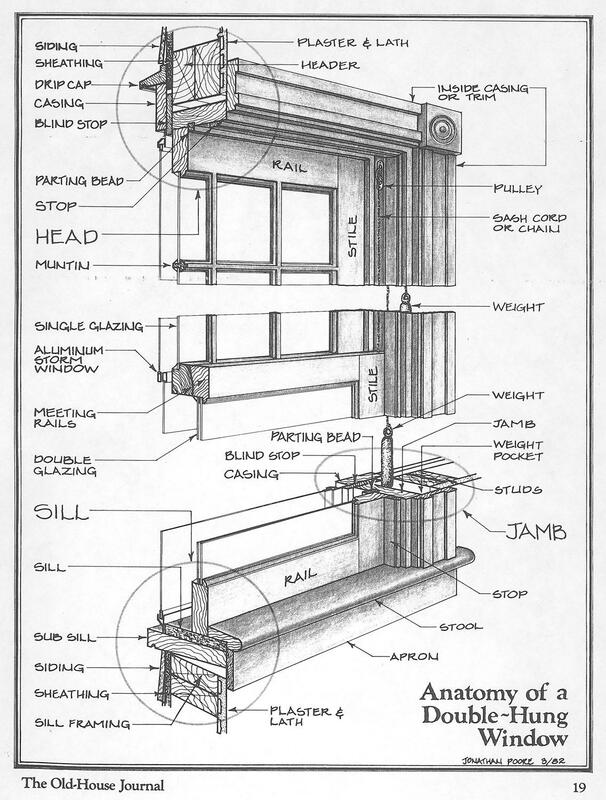 In the case of this vintage 1980’s casement style window, the outside metal frame and the metal crank hardware were transmitting frigid cold into the window’s crank assembly pocket. Water condensed there, froze, and expanded as more humid air condensed and froze. The short term fix was to get the moist air moving, so I set a dehumidifier running in that area. After ice thawed, I also pried open the crank assembly to let it dry out. I later insulated this with expanding foam just to get it through the winter. The long term fix is to replace the window with a new energy efficient window that is both insulated and has thermal breaks to keep the cold (and summertime heat) outside. Obviously, I’ve presented a fairly extreme example, but it does illustrate how past window construction methods can actually cause serious problems and affect your home’s value. If your windows are older and show signs of rot (soft, spongy wood) or you feel drafts coming from them, then you should consider replacing them with energy efficient EnergyStar-rated windows. Energy efficient windows are rated in terms of U-factors. The U-factor measures the rate at which the window conducts heat through it — either from the inside or the outside. Lower U-factors means less thermal bridging. Most low-U windows are double-glazed (two sheets of glass) and contain an inert gas that acts as an insulator. Low-emission coatings (Low-e) further reduce heat conduction through the glass, making them even more energy efficient. These add to the cost of the window, but substantially reduce energy loss by up to 50%. For more information, many top brand window makers (Pella, Jeld Wen, Andersen, Marvin) post window specs and installation instructions online for all their energy saving window products. If your windows are still in good shape, now is a good time to give them a mid-heating season check up. Wet the back of your hand and feel along the window edges for any cold drafts. Next, open the window and inspect the weatherstripping. Replace any weatherstripping that is worn or torn with new material from your local home center. If your windows are the older wooden sash-kind with glazed panes, look for loose or missing glaze. You can caulk over any loose or missing glaze with silicon caulk as a short term fix, but remember to have these properly re-glazed when the weather warms up (check out this excellent old sash-window tune up). Another thing to consider for older windows is to install new storm windows. Assuming your old windows are in sound condition, newer storm windows can provide nearly the same energy savings as whole new energy efficient windows for about half the cost. And pay attention to the condensation quote about NOT caulking up the bottom edge of the storm window! Stay tuned for Part 2 of this series coming next week so that you can learn different home improvements you can make in 2014 to improve your energy efficiency!